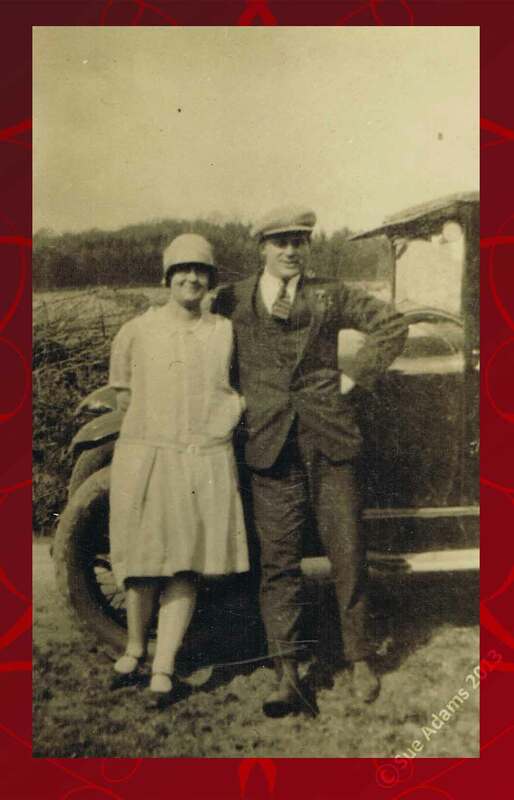 This week’s 50 Marriage Mondays post concerns my maternal grandmother, Isa, and her first husband, Charlie. As all her surviving descendants are from her second marriage, this marriage has been little discussed. 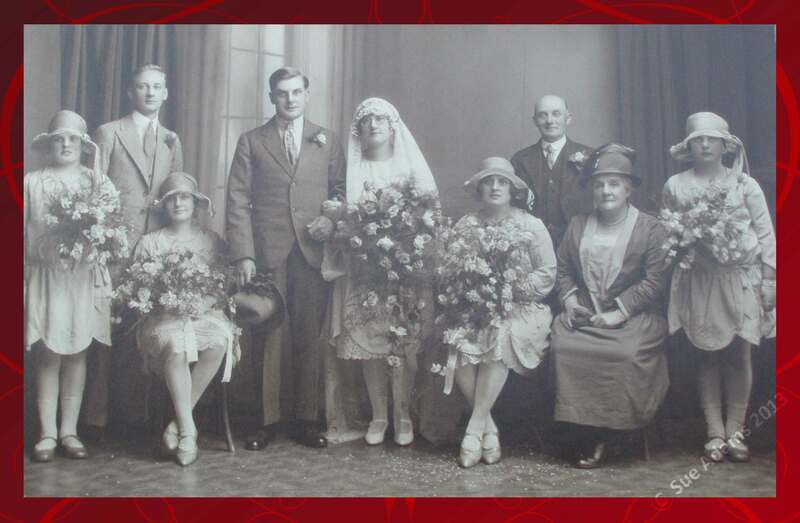 All of the people named on the marriage certificate, except the groom’s deceased father, appear on this photo of the core wedding party: bride, groom, parents, probable best man and bridesmaids. The person missing is the groom’s mother. Only one of the bride’s three then living brothers, Charles Percival Fleming Jones, who served as a witness is included, so I think he may have also served as best man. The other witness was the bridesmaid seated next to the bride, Sarah Jane Brown, the groom’s sister. The two younger bridesmaids standing at either side are Doris and Gwendoline Brown, nieces of the groom, but I am not sure which is which. The fourth bridesmaid is Muriel Simms, the bride’s maternal first cousin. The older couple are the bride’s parents, Charles Bertram and Mary Louisa Jones. BROWN Alice of 45 White-road Sparkbrook Birmingham 11 widow died 10 May 1942 Probate Birmingham 8 July to Alfred Dean motor driver. Effect £138 13s 4d. As Charlie was only about 6 when Alfred joined the household, it is likely that Alfred influenced Charlie’s development as a motor mechanic. Cause of death: I(a) Actinomycosis of Liver (b) Abscess of Groin (Laparotomy 4.7.30) No P.M. The cause of death was a slow and unpleasant one. Actinomycosis, caused by the bacteria Actinomyces israelii, is usually an infection of mouth, digestive tract, or respiratory system, which typically results in inflammation and abscesses. Only a small proportion of cases involve the liver, so Charlie’s case was unusual. Diagnosis is difficult because the bacterium requires anaerobic culture conditions. Family anecdote suggests that several conditions were considered, including psittacosis as Alice had a pet parrot. The laparotomy, a surgical opening of the abdominal cavity, probably confirmed diagnosis but lead to spread of the infection to the groin. Consequently, a post mortem was unnecessary. The condition would be treated with penicillin today. In 1930, penicillin was a very recent discovery that did not become widely available until methods of mass production were developed in the 1940s. Isa’s daughters know that Isa and Charlie had a baby boy named Peter, who died shortly after birth. However, official records of the birth and death have proved elusive. Even a stillborn child should have been registered as stipulated in the Births and Deaths Registration Act 1926, but there is no good match in the online birth registration index. It is thought that Peter was born a few months after Charlie’s death at Isa parent’s home, where she returned after Charlie’s death. Special thanks to Isa’s daughters for sharing the certificates and photos. Hi Sue: Thanks for the interesting research. Enjoyed your post. Some very good genealogy work.